After seeing him in THE LOST BOYS, I couldn't get enough of his movies. Though I reckon his character in TLB was the best character he ever played. I was also a huge fan of the Two Coreys - though Haim was always my favourite! Then one day he just faded into obscurity - gone. He developed a drug problem and I guess that became more important than the actual acting. It's too bad. He was pretty good on screen and I thought he was the cutest! I had posters of him all over my bedroom walls, school books, folders... anywhere and everywhere. It's a real shame about him! You are too funny. I never met Corey Haim, but I did meet the "other Corey" (Corey Feldman) a few years ago. 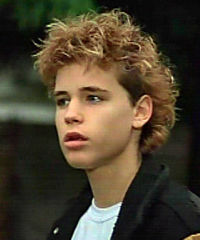 Corey Haim was good in "Silver Bullet" but I personally am not a fan of his at all (I used to be though). LOL! My sixteen year old niece loves the Coreys. I think he's doing better now. He's lucky he survived such hard living. Yeah, I read he's doing much better after having a drug-induced stroke and slipping into a coma in 2001! Hope he's taking better care of himself now.